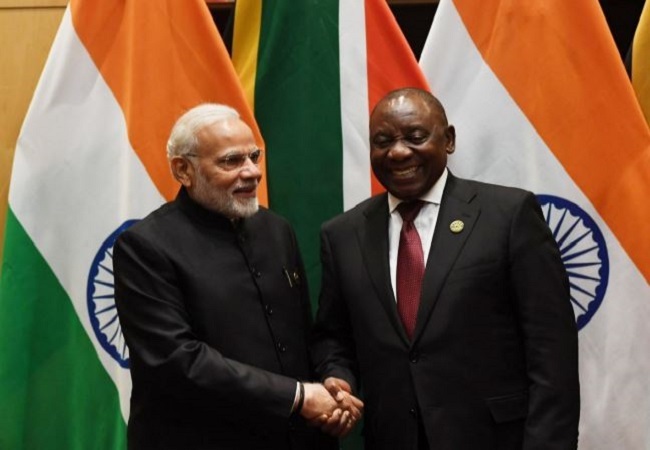 South African President Cyril Ramaphosa was the Chief Guest at the Republic day Parade 2019. The Republic Day Parade Ceremony commenced with Prime Minister Narendra Modi leading the nation in paying homage to the martyrs by laying a wreath at the Amar Jawan Jyoti at India Gate. As per the tradition, after unfurling of the National Flag by the President, the national anthem was played with a 21 gun salute. South African President Cyril Ramaphosa is the chief guest at the Republic Day parade this year. He is the second South African president to be invited to the event as the chief guest. India celebrated its 70th Republic Day on Saturday with a grand display of its military might and rich cultural diversity as the ceremonial parade rolled down the majestic Rajpath here in presence of South African President Cyril Ramaphosa as the chief guest.